You will want to tune-in to this one. 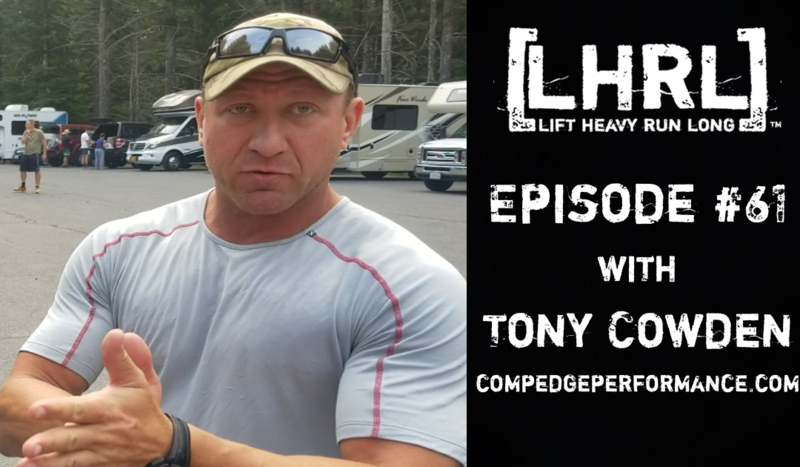 On episode 61 of the LHRL™ Podcast we speak with Tony Cowden of Competitive Edge Performance. He is an incredibly tough and rugged endurance athlete with a humble and kind spirit. We could have easily made this a 5-hour episode, as his adventures just brought about more questions. Tony Cowden was an outstanding guest who has done great things with his life, and even better things for our country. Tony has 22 years in the Special Operations community, serving over 8 years and 28 deployments in Afghanistan, Iraq and other Central Asian and Africa countries. He began training for and competing in triathlons in 1998 and in 2005 in functional fitness competitions. He got his Level 1 CrossFit® Certification in 2006. He affiliated CrossFit Wilmington in 2007. He qualified for the 2012 Games., is a USAW Masters Weightlifting Champion in both the 94kg and the 105kg divisions. He is a successful triathlete, completing more than 50 races, including Iron Distance races. Tony coached his first athlete to The CrossFit Games in 2009, and has since sent 16 more, including teams and masters athletes.He has sent 28 athletes to The Games Regional competitions, and developed Powerlifters, Strongman Competitors, triathletes, Ultra Endurance athletes and Military personnel. In September 2016, Tony completed the first annual 106º West Half Iron Distance Triathlon in Dillon, CO. At 10,000 plus ft, the 106 West is the highest elevation triathlon in the World.With early morning temps at just over freezing, gusting winds, water temp of 50 degrees, and the steep climbs you would expect of the Colorado Rockies, the 106 is one of the most challenging. Continually proving the END|Strength methods, two days after the race, Tony squatted 505lbs and Deadlifted 505lbs for 6 reps. Most recently Tony attempted his first ultra endurance event… the BigFoot 200. A 200 mile ultra marathon in the Cascade mountains of Washington state. From the hot desert of Mt. Saint Helen’s desolation zone, to the wet forests, and freezing temps during the night, the Bigfoot bested Tony. His first ultra also turned out to be his first ever DNF. At 131 miles, he ran out of time. A testament of our methods and his dedication to purpose, Tony dropped 35lbs of bodyweight in the 5 weeks prior to the race and maintained a 500lbs squat and 550lbs deadlift throughout the endeavor. There is quite literally no other coach with Tony’s resume and experience. It sets him apart… but what really makes him a higher caliber athlete and coach is his commitment to applicable, proof based knowledge. He will only coach athletes and even speak on topics he has up to date and relevant experience in. Great podcast! Tony is the real deal and it’s cool to see his name out there. Thanks so much! Yeah, he is definitely the real deal. I’m humbled to have had him on the show.